Niueans are a proudly Christian people. 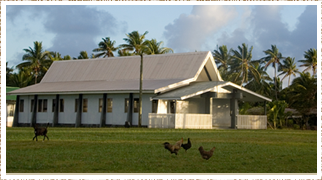 Seventy five per cent are affiliated with the Protestant Church of Niue (Ekalesia Niue); the remainder are a mix of Catholic, Latter Day Saints, Jehovah Witnesses, Seventh Day Adventists and Baha’i. The church underpins all social interaction, provides moral guidance and enables the redistribution of goods and services from those that have, to those less well-off. It also upholds traditions within the context of a changing world. Even though the first white missionary arrived in 1830, Niueans were actually converted to Christianity by one of their own people. Peniamina was a Samoan-trained Niuean who returned to his own village of Mutalau in the far north in 1846. His influence was very deep. When the first resident pastor George Lawes arrived in 1861, he found the inhabitants devout and welcoming and there were only eight non-Christian Niueans on the island.